The next book in Quirk's best-selling Stuffseries, Jokes Every Woman Should Knowis filled with hilarious jokes, stories, and one-liners. Topics include men, marriage, being single, careers, kids, gynecology, money, and much more. 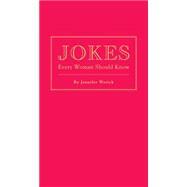 With more than 100 jokes, alternate versions, and tips on timing, audience, and delivery, Jokes Every Woman Should Knowis the only joke book you'll ever need.